countrymen Henrik Lundqvist and the late Pelle Lindbergh. First it was Czechs. More recently, it was all the rage to for NHL teams to draft Finnish goalies. Now it seems as though clubs are scouring Sweden in search of the next Henrik Lundqvist. A handful of Swedish netminders have graduated to the NHL in the years since the late Pelle Lindbergh won the Vezina Trophy in 1984-85. But until Lundqvist came along and took New York by storm, there had not been a bona fide NHL goaltending star from Sweden since Lindbergh's passing. Coinciding with three-time Vezina finalist Lundqvist's rise in the NHL has been the emergence of a new generation of young Swedish goaltenders with the potential to go places. The cream of the crop among those 23 and younger include highly regarded Detroit Red Wings prospect Daniel Larsson, Buffalo Sabres hopeful Jhonas Enroth, Phoenix Coyotes draftee Joel Gistedt, New York Islanders selection Stefan Ridderwall and top-ranked 2008 NHL Entry Draft prospect Jacob Markström. Other candidates with upside include Eddie Läck, Christian Engstrand and Mark Owuya, while 23-year-old former Montreal Canadiens draftee Christopher Heino-Lindberg remains a dark horse free-agent prospect. In addition to being technically sound, Larsson is known for being a tough goaltender to rattle. Chosen by Detroit in the third round (92nd overall) of the 2006 Entry Draft, the 22-year-old had a breakout season for Djurgårdens IF Stockholm. Larsson posted a 2.29 goals-against average, .921 save percentage and six shutouts to earn both Rookie of the Year honors and the Leif "Honken" Holmqvist Trophy as the Swedish Elite League's best goaltender. "One thing about Daniel is that he always keeps calm in every situation. He's mentally strong, very quick and has good technique," Ridderwall said. Teammate Owuya expected to be drafted by an NHL last year, when he was Central Scouting's top-rated European goaltender in the midterm rankings and second to Joel Gistedt in the final rankings. But lingering questions about his conditioning and focus knocked the outgoing former Swedish "Idol" TV show contestant out of the 2007 Draft. Owuya, who will turn 19 in July, didn't have as strong a 2007-08 season as he would have liked. Despite dressing as Larsson's backup in 10 games — making his Elite League debut by playing 25 minutes of one game — Owuya never seriously challenged Ridderwall's spot this season. In 21 games for the J20 SuperElit squad, Owuya posted a 2.86 goals-against average and .901 save percentage. He was loaned for eight games to Mälarhöjden/Bredängs IK, a senior level team in Division I (two steps below the Elite League). In seven starts at that level, Owuya had a 2.37 GAA and .912 save percentage. He closed out the season by performing well in three playoff starts for Djurgårdens' J20 team, including a shutout. Larsson propelled his lightly regarded team into the playoffs. After the season, the Red Wings signed him to an entry-level contract. "Larsson has adapted well to being a No. 1 goalie. He is very well schooled, his side-to-side game is very strong and he can read the game with excellent maturity for a young goaltender. Coming from northern Sweden (Boden), he's calm and not a man of many words," said Hakan Andersson, the Red Wings' renowned European scout. Enroth's team, Södertälje SK, missed the playoffs this year. But that was scarcely the fault of the Buffalo Sabres' 2006 second-round pick. SSK was the lowest-scoring club in the 12-team league — its 123 goals scored were 10 fewer than Mora IK, a team that was ultimately relegated to the minor-league level. Enroth split duty with veteran Björn Bjurling (a former Edmonton Oilers draft pick) and kept his team close in most of his 27 appearances, posting a stellar 2.13 goals-against average, .932 save percentage and a pair of shutouts. He was a runner-up to Larsson for the Rookie of the Year award. Enroth also provided outstanding goaltending for Team Sweden at the 2008 World Junior Championships in the Czech Republic. Known for his strong self-confidence as well as his athleticism, Enroth was widely praised for his role in leading the Swedes to the silver medal. "When I was younger, I looked up a lot to Henrik Lundqvist and Martin Gerber and tried to mix their styles," Enroth said. "But now I'm just working on the development of my own style. I look a lot on those NHL goalies that have the same size as me, like Vesa Toskala, Gerber, and Tim Thomas, and try to find something that I can use." The Sabres recently signed Enroth to a three-year entry level contract, and he will likely start the 2008-09 season in the American Hockey League. Although Ryan Miller currently has a firm grasp on Buffalo's starting job, there's no such thing as too much depth in the system. "We're very happy to have Jhonas under contract. He's performed very well in Europe, and we look forward to his continued development as a member of the Sabres organization," Buffalo general manager Darcy Regier said. For his part, Enroth wants to get acclimated as quickly as possible to the angles on the smaller North American rinks — a process that often takes at least half a season. But the player adds that he'll always fondly remember the just-completed Swedish and international season. 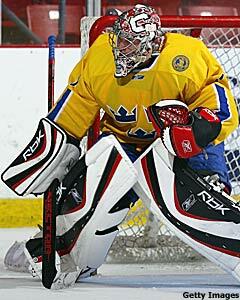 "The best memory from the WJC is the semis and the finals,” Enroth said. “We played so good the whole tournament and I have memories I will never forget. It is the highlight of my carrier so far. From SSK, I'll remember my first game in the Elite League — the season opener when we won 2-1 against Mora — and my first shutout. That was a 1-0 game. We beat Timrå on the road." Many of the top young Swedish goalies either hail from Stockholm or its outskirts or played junior hockey in or around Stockholm. Larsson, Enroth, Heino-Lindberg, Ridderwall, Läck and Owuya all fit this description. In recent years, Djurgårdens in particular has become something of a goaltending-prospect factory. In addition to Larsson, Ridderwall and Owuya suited up for its Elite League team this season while continuing to get playing time for its under-20 squad. Ridderwall, who is a year older than Owuya and considered by far the more advanced of the two keepers, spent most of the 2007-08 season backing up Larsson. The Islanders' sixth-round pick (173rd overall) in the 2006 Entry Draft dressed in 45 regular-season games but only got into 11 Elite League games. It's tough for any goaltender, especially a 19- or 20-year old, to stay sharp with sparse playing time, which is why Ridderwall also suited up in eight games for Djurgårdens' J20 SuperElit team, posting a 1.75 goals against average, .934 save percentage and one shutout. He was also loaned to Allsvenskan clubs Nyköping (one game) and Almtuna (three starts). While with Djurgårdens' Elite League team, Ridderwall acquitted himself well with a 2.68 goals against average and .906 save percentage. Although he remains unsigned by the Islanders, with the expiration of the NHL-IIHF transfer agreement, the 2006 draftee's NHL signing rights still belong to the Isles. For next season, his main goal is stake down Djurgårdens' starting job. "First of all, I want to play a lot of games. I feel that I'm technically well developed but there was a lack of games last season due to Daniel Larsson’s success. I will also work a lot on my skating and rebound control," said Ridderwall, whose father, Rolf, is a former Djurgårdens and Swedish national team goalie. The 6-foot-2, 200-pound Ridderwall says he tries to focus on developing his own style but originally drew inspiration from the competitive drive of Patrick Roy and tries to incorporate small elements from other goalies' games into his own. In the case of Larsson, Ridderwall came away marveling at his teammate's focus. "I don't think you can count out Owuya, but other (prospects) passed him this year," said a European scout for a Western Conference NHL team. "He's a big goaltender (6-foot-2) and he's still learning some of the technical aspects. But he has a strong self-confidence and he likes to play in big games." Meanwhile, former DIF prospect Läck left the Djurgårdens system in 2006 for an opportunity to play for Leksands IF, a longtime Elite League club that now plays in the next-level Allsvenskan. "They have a lot of great goalies there, and at that point I felt that there wasn't a way up from the juniors," explained Läck, who's now 20. "I wanted to play with the seniors and Leksands said they would give me the opportunity if I played good, so here I am. I haven't regretted my choice one time. I love playing for Leksands and hope we will have a good season and advance to the Swedish Elite League." Läck, who was rated among the top 2008 draft-eligible European goaltenders in Central Scouting's midterm rankings, dropped off the final top five. Nevertheless, the 6-foot-3 keeper had a strong senior-level season for Leksands, posting a 1.87 GAA, .923 save percentage and four shutouts in 24 starts before struggling in two appearances during the playoffs for Elite League promotion. Södertälje SK goaltender Jhonas Enroth was selected by the Buffalo Sabres in the second round of the 2006 NHL Entry Draft. 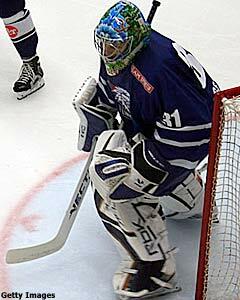 Playing for Leksands in 2007-08 afforded Läck the opportunity to watch and learn from former NHL star Ed Belfour. The 42-year-old, who started 20 games this season, joined Leksand after a 17-season NHL career that included two Vezina trophies and a Stanley Cup. Although Belfour has a reputation for surliness, Läck says the veteran was gracious and helpful in his preparations to take over as Leksands' full-time starter next season. "Ed was a great inspiration and he helped me a lot on ice as well as off ice. I'm hoping that his advice is going to help me take another step next season to develop my game. I'm definitely trying to learn all about his stickhandling, which was incredible. I hope to get results with it," Läck said. Läck may or may not be selected in the mid-to-later rounds of the 2008 NHL Entry Draft. Nineteen-year-old Linköping HC prospect Christian Engstrand is in the same boat, having also been passed over a year ago. Even if they're not selected now, they are names to file away for future reference. The 6-foot, 195-pound Engstrand had an excellent J20 SuperElit season in 2006-07, but there was no spot for him on the Elite League club this season. He backed up former Washington Capitals goalie Rastislav Stana in six games, but didn't get into a game. Engstrand spent most of the season on loan to an Allsvenkan club, IK Oskarshamn. In 20 starts, he posted a 3.06 goals against and .902 save percentage. "My goal for the next season is to establish myself as a starting senior goalie. I'm going to start this season with Oskarshamn and, hopefully, if everything goes as planned, the season after that I'll be first goalie in Linköping," Engstrand said. Some scouts have compared Engstrand's potential to Columbus Blue Jackets goaltender Fredrik Norrena. The player himself points to the Finnish goalie as one of his key influences as a player. "I talked to Fredrik a lot when he played in Linköping and he gave me many tips," Engstrand recalled. "In terms of my own game, I think my biggest strengths are my mental strength and that I try to stand up as much as possible. I want to become a better stickhandler and I need to practice moving around the net to catch loose pucks." One player who is a lock to be chosen in this weekend's NHL Entry Draft is Markstrom. The tall, rangy Brynäs IF Gävle goaltender with the butterfly style has a chance to become the first Swedish goaltender to be selected in the first round of the Draft. Markström is coming off an outstanding season that saw him lead Sweden to victory at the Ivan Hlinka Memorial Tournament, advance from the J20 SuperElit level to the Elite League and help Brynäs avoid relegation — he put up a gaudy 1.78 goals-against average, .931 save percentage and two shutouts in nine starts during the qualification series. After a long season of hockey, scouts say he appeared fatigued at the Under-18 World Championships in Russia, where he struggled at times. At least at the Elite League level, the 2007-08 season didn't quite go as well as Heino-Lindberg or Gistedt would've liked. Both had hoped to play a lot more than they did. Heino-Lindberg entered the 2006-07 campaign poised to take the full-time starting job for perennial championship contender Färjestads BK and challenge for a spot on the Swedish national team. The Montreal Canadiens were already stacked with fine young goaltenders (Carey Price and Jaroslav Halak), so the Habs elected not to sign Heino-Lindberg, a 2003 draftee. But with a strong season, there was the possibility that other NHL clubs would pursue him as a free agent. Nineteen-year-old Linköping HC goaltending prospect Christian Engstrand is projected as a mid-to-late round selection in the NHL Entry Draft. Heino-Lindberg's season got off to a decent start, but a groin injury kept him out of action for several weeks. 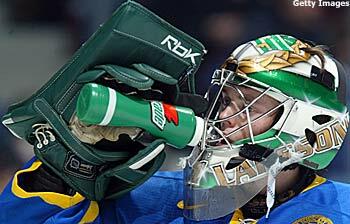 In the interim, Färjestad acquired Finnish goaltender Juuso Riksman on loan from the St. Louis Blues. Heino-Lindberg, who turned 23 in January, ended up splitting time in net with 24-year old Jonas Gustavsson (20 appearances) and Riksman (seven games before moving on to Russian team Lokomotiv Yaroslavl). In 29 games, Heino-Lindberg posted a respectable 2.67 goals against average with a .910 save percentage and one shutout, but was not as consistent as he wanted to be. Known simply as "Heino" to his teammates, the goalie had a .931 save percentage and 3.02 goals against in five playoff starts before being forced to sit with more groin problems and giving way to Gustavsson. After the season, Färjestads announced that it was not renewing Heino-Lindberg's contract for next season. There were rumors that Rögle BK Ängelholm (recently promoted to the Elite League) would sign him. But in late April, he signed with AIK, a Stockholm-based club that was once a fixture in the Elite League but has been an Allsvenskan team since 2002. AIK is coached by former Färjestads bench boss Roger Melin and the club has been loading up for a run at promotion to the Elite League next season. "I had a middling year with a lot of injuries, and it's unfortunate that I didn't get a spot on the national team" Heino-Lindberg told the Swedish newspaper Aftonbladet. "But I hope to be back in Elitserien soon." Heino-Lindberg will need a strong campaign next year with AIK and a triumphant return to the Elite League to get his NHL dreams back on track. "Christopher is a strong-willed young man, on and off the ice. There's no denying his talent. Heino has a great glove hand, very quick movement and can steal games sometimes. He still has the potential to go places in hockey but he has to stay healthy and dedicate himself to reach the next level," the Western Conference scout said. "We've all known about his potential and his talent for years. The rest is up to him." Meanwhile, Gistedt, a second-round pick by the Phoenix Coyotes last year, entered the 2007-08 campaign hoping to beat out former New Jersey first-round pick Ari Ahonen for the starting Elite League job for the Frölunda Indians of Göteborg. The previous season, Gistedt had an impressive year at both the J20 and Elite League levels while starting for Sweden at the 2007 World Junior Championships. During the 2006-07 season, Gistedt supplanted former NHL goaltender Tommy Salo as Frölunda's starter. But the 20-year-old Gistedt fell victim to the sophomore jinx in 20070-08. Ahonen wound up getting the vast majority of the playing time, while Gistedt scuffled to stay sharp in limited minutes. Gistedt posted an unimpressive 3.84 GAA and a .857 save percentage in 11 games. He fared considerably better in five games for Frölunda's championship-winning J20 squad, posting a 1.38 goals against average and .943 save percentage. Despite his up-and-down season in Elitseren, Gistedt continued to display the fine puckhandling skills and work ethic that convinced Phoenix to draft him last year. After the season, the Coyotes signed Gistedt to an entry-level contract. Many consider him the Coyotes goalie of the future.